A programme designed to maintain the physical and mental well-being of patients after hospital-based treatment for chronic obstructive pulmonary disease (COPD) will be tested at Leicester’s Hospitals, thanks to a new £336,000 grant from the National Institute for Health Research (NIHR). COPD describes a group of lung conditions that make it difficult to empty air out of the lungs because the airways are narrowed. Patients suffer from shortness of breath and tend to avoid activities which make them breathless, causing muscles to waste and weaken. An added problem is that patients often have repeated chest infections, some requiring hospital admission. This is detrimental for the patient and costly for the health service. Patients with COPD who are treated at Leicester’s Hospitals are offered pulmonary rehabilitation to manage their symptoms. This is a package of supervised exercise and education which is known to improve physical and mental well-being, as well as prevent future hospital admissions. However, not all the benefits of rehabilitation last once patients finish the programme and patients talk about a feeling of ‘abandonment’. 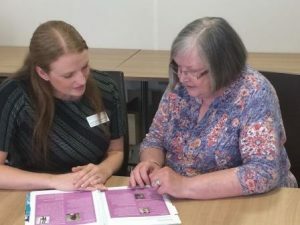 In an attempt to overcome this issue, a research team led by Dr Linzy Houchen-Wolloff has designed a new maintenance (on-going support) programme for patients with COPD, utilising their successful ‘SPACE for COPD’ manual. Dr Houchen-Wolloff, a senior research physiotherapist at Leicester’s Hospitals, explains: “In this study, we will divide people into two groups at the end of their pulmonary rehabilitation programme. One group will receive the current care package, including referral to a community exercise programme if wanted. The second group will receive the current care package plus the new maintenance programme. If successful, the new maintenance programme has the potential to preserve and enhance the benefits of pulmonary rehabilitation for the patient over the long term. This may reduce hospital admissions, so has the potential to save the NHS money. Funding for the research has been awarded under the NIHR Research for Patient Benefit programme and will be supported by the NIHR Leicester Biomedical Research Centre. The aim of the programme is to fund research projects in health and social care to improve, expand and strengthen the way that healthcare is delivered for patients, the public and the NHS. One reason for the application’s success was due to the high level of involvement patients had with shaping the research. Patient input into the design of the study, including how the maintenance programme works, helps to ensure that it has an impact on the people it is designed to benefit. Freda Smart, from Oadby in Leicestershire, is a patient with COPD who sits on the project team for the study. She said: “I developed asthma and later COPD when I was 60. You have to stop and catch your breath and then people look at you, which is embarrassing. It’s isolating as you tend not to want to go out. “I first got involved with the team at Leicester’s Hospitals when I was a participant in the ‘SPACE for COPD’ programme. I saw a leaflet in the physiotherapy clinic about research and rang up. I joined the patient and public involvement (PPI) group and have been involved ever since. Dr Houchen-Wolloff added: “Patients come up with the research idea based on what their problems are. In this study, we took a tentative project idea to Freda, who helped us refine the research question and plan how we might answer it. For example, this study involves group sessions – Freda helped us work out when and where we should hold them and how long they should last.